A ten hour flight and here we are in Buenos Aires. The Hotel is grand and comfortable. A short rest and we began a short five mile, three hour stroll around one section of the City. The City is very European. Wide boulevards, lots of parks, generally a pleasant place to stroll (reminds me of Paris). Carol reminds me that we were here together more than twenty years ago. I have no memory of anyplace I was today but she swears that we were to all the places we walked to today before. It is frightening to get so senile so fast! 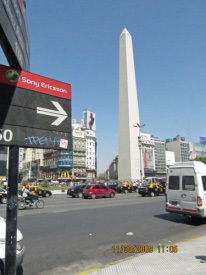 The Obelisk in the photo is impressive but not as large as DC. The walk back to the Hotel was along the main shopping center of the City. It goes for miles with shops on both sides. 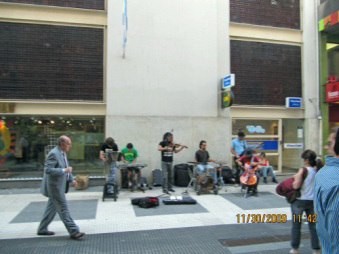 Street musicians play along the way and mimes and other street performers dot the way. Most impressive was the fact that even though the recession has hit every country there was not a vacant store all along the whole two mile stretch. A late supper and an early start to the Falls tomorrow.